“When most people think of Enterprise 2.0, they think of the use of collaborative tools,” Tapscott said. “I’m arguing that something much bigger is happening than the application collaborative tools within the enterprise–it’s a profound transformation of the enterprise as we know it.” Basic principles of organization that have been established over the last 100 years are being upended, leading to “huge changes in how we orchestrate capabilities to create goods and services,” Tapscott said. Like Tapscott, I’ve long been a proponent, along with thought leaders like John Hagel, that there’s a deep and profound Big Shift taking place as we get deeper into the 21st century. To survive, we must think in deeply networked, decentralized terms now, not in the rapidly receding business concepts of an age bygone. This means platforms instead of products, ecosystems instead of businesses, peer production instead of central production, and networks instead of hierarchies, to name just a few of the more significant aspects of the shift. But how can traditional organizations get there? Web companies have a hard enough time getting there themselves, as digital natives. Most of them certainly don’t become the next Amazon or Facebook, two companies that virtually embody much of the changes taking place. Instead, I see many traditional firms engaging in the cargo cult mentality, hoping that by adding window dressing like social media, a few APIs, and perhaps some user-generated content, that they too will suddenly have a healthy, sustainable future. Well, it’s not going to happen that way. The changes required are deep and sometimes painful. In fact, the more I examine the issue, successful transformation to a new mode of existence that naturally avoids the disruption inherent in these shifts boils down to a surprisingly few number of key changes. But those changes, though not generally that complex in and of themselves, are almost impossible to drive deeply into many organizations by virtue of their existing structures and processes. As they say, culture eats strategy for lunch. Many of you know that I’ve been exploring how to foster social business approaches in large organizations for a number of years. When I see successes, they seem to have much in common with what made things like social media so successful. Yes, that’s network effects but also, and more to the point, about enabling an environment where emergent change can actually take root and thrive. A network effect can’t take hold if everything about the traditional way a business operates is to lock everything down into fixed transactional processes. That just doesn’t work in a fast changing new era where the value is in sustaining dynamic relationships and not fixed transactions. Local autonomy. 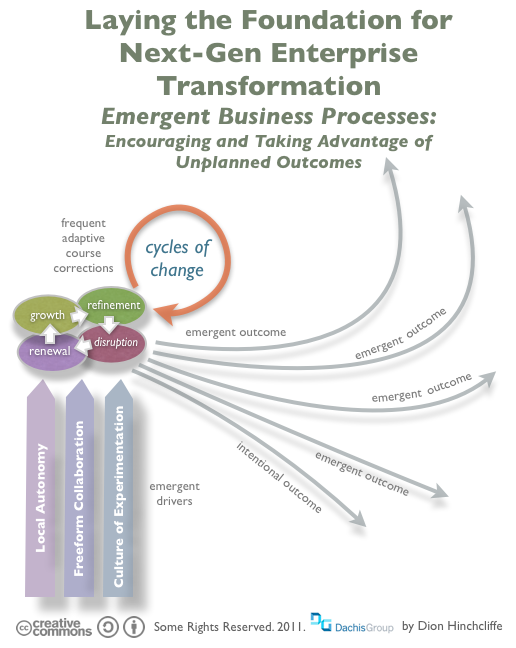 Effective, resilient response to business change can’t only be driven by top-down, hierachies. It’s far too slow, low in innovation, and far from problems on the ground. Restructure the organization so that change along the edge is not only possible, but well-resourced, common, and effective. Freeform collaboration. Going beyond Enterprise 2.0 to reinventing the way business models scale and provide value. I’ve previously written about the orders of magnitude cost reductions that are possible and the things they enable, plus how to get there. A culture of experimentation. Of the three, this is the hardest. The first two are different; it’s always possible to create a startup culture at the edge of organizations and it’s also possible to drive mass collaboration. We increasingly see it done all the time in large companies, though it takes time to really establish itself in a transformational way. But to get an organization to be fundamentally more accepting of innovation is very difficult to instill when it does not already exist. Some of it is a skill problem, but a lot of it is more systemic. Solving this is going to be one of the great generational challenges of the social business era. There’s a lot to consider when undergoing the large-scale transformations that businesses must undertake today, but a focus on these core issue will go way towards getting started.